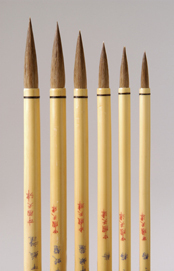 Unlike watercolor, oil and most other paintbrushes, Sumi brushes are composed of two separate parts. The central core, which determines the height and basic function of the brush, is made of relatively stiff hairs gathered to form a tapered point. •	The outer wrapping consists of softer hairs which are selected for their greater water-holding capacity and for facilitating smooth strokes. •	The hairs of the inner core and of the outer wrapping are the same length and come to a point when dipped into water. •	The hair structure ensures smooth maneuverability and dynamic strokes whether light or heavy pressure is applied. •	Traditional horse hair bamboo brushes give a crisp touch and are ideally suited for ceramic decoration. Brush Discount: 20% off 12 or more. 10% off 6 or more.